Artists have historically been the mouthpieces of their generation—especially in divisive times—and a new exhibit in Shaker Heights is amplifying their much-needed message. 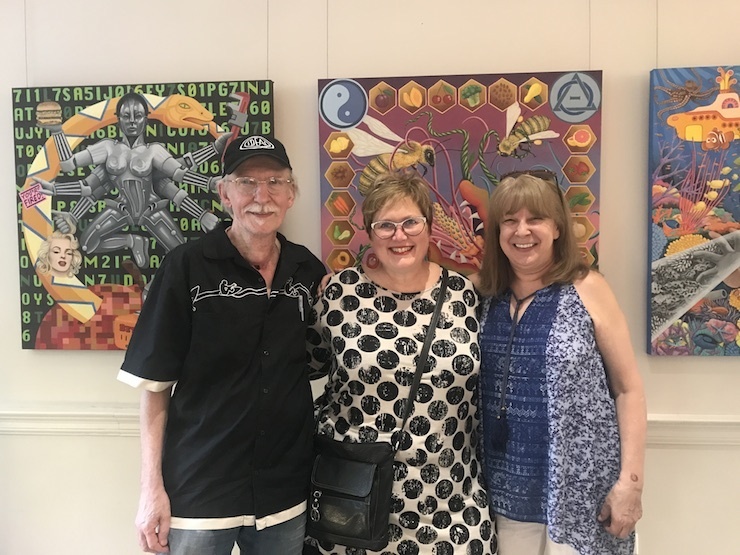 Housed in the Shaker Community Gallery (inside the small rectory of Christ Episcopal Church) and curated by Leslye Arian, Art of Dissent features the work of four local artists concerned about the environment, human rights, and inequality. And from climate change to Charlottesville to immigration, no topic is off limits. The Invisible Man Returns to Fascism by Gary DummCase in point: Laura and Gary Dumm, who continue their environmental monster series with pieces taking on global warming of the oceans with “Reef, (err), Madness” and automation with “Washed Away In The Digital Reign,” in addition to “To Bee or Not to Be” about killing off pollinators. 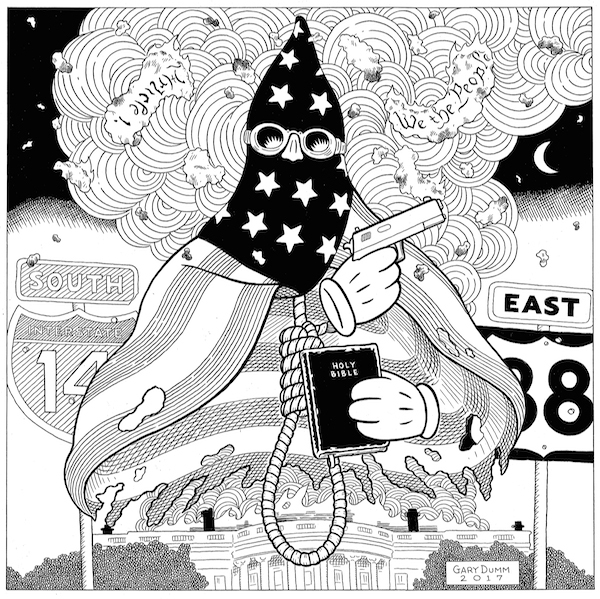 The show also features Gary Dumm's "The Invisible Man Returns to Fascism," an ink drawing depicting a gun, bible, and clansman's hood fashioned from a tattered American flag as a direct response to the recent events in Charlottesville. Michelangelo Lovelace takes on Trump’s border wall with his painting of bricks and eyes titled "The Deportation Wall." He also leads viewers down various streets of choices and circumstance in smaller paintings included in the exhibit. Liz Maugans takes the protest to the streets with her Apathy Parade prints, which display banner messages ripped from social media. She has also created small prints for visitors to write their own banner messages, which the gallery will post. The show is also hosting a series of community forums on topics like "Owning Protest Art," "The Spirituality of Dissent," and "Duos of Dissent." For the latter, married artists Laura and Gary Dumm will join married poets Sara Holbrook and Michael Salinger to discuss arts collaboration within a relationship on Wednesday, September 27. The Dumms have embellished their successful marriage and personal careers with a thriving collaborative art partnership. And speaking of dance, the "A Dance of Opposition" panel will gather company directors from Verb Ballet, City Ballet of Cleveland, and more to share their experiences choreographing works that address the current political situation. Art of Dissent runs through Oct. 7 at the Shaker Community Gallery (3445 Warrensville Center Rd. ).